A free dating and social site for gothics, punks, metal heads and other alternatives. Inside you can access email, send flirts, create friend groups, and search for others by music interest. Despite the dodgy sounding name, Altscene, is a free meeting site for anyone following an alternative lifestyle. Altscene is for goths, punks, emos, metalheads, rockers, and skaters who're looking for romance. It welcomes just about anyone who doesn't fit-in with conventional trends. Altscene could be the answer if you're looking for a soul mate but haven't found yourself fitting into the stereotypical format of regular dating sites. As well as new friends who follow their particular music or lifestyle interest, you can post yourself as interested in dates. As a member you can send email, flirts or friend requests to increase your social circle. If you wish, you can list favorite bands and music style and in doing so connect with others who share the same tastes as yours. The quick search box allows search by location, gender, sexuality, age-range and favorite music. If you can't quite think of that band or music type, the tool will make suggestions based on the first few letters you type. There's also a community chat room and a lively forum where users can freely discuss topics of their choice. All services are free, including full communication with other members. 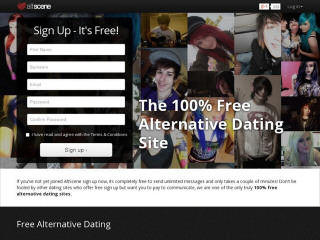 Altscene is a non-mainstream dating site that will attract a certain cult following. The feeling on the site is appealing and intuitive, and it doesn't overwhelm you with a plethora of tools and options. Rss Feeds. Subscribe to comments for this site. [?] Receive updates about Altscene.com directly through your newsreader. What a crock of utter ego driven utter****e. This is by far the worse dating site I have ever been on! If you're not showing a large amount of cleavage, wearing more make up to out do Coco The Clown, living it up with the good ole trout pout and blonde - as a female - you get ignored. I cannot comment on the man's side of things ... But I am sure they have similar issues. Alot of ignorant a-holes on there as I have sent messages after they stalk my profile and they don't reply. Watch out for the emotionally unstable, paranoid types as well. And finally the 27-30 yr olds who act like the big men and belittle the women on there. For example: I cannot have anymore children due to it being a risk to my life, and some 27 yr old messaged me to say that I had no right to tell men whether they can or cannot have kids! Altscene 0.56 7 A review of Altscene. A free dating and social site for gothics, punks, metal heads and other alternatives. Inside you can access email, send flirts, create friend groups, and search for others by music interest.